This is what we call using the leftover broccoli stalks from other meals and recipes for your juicer and juicing recipes. If you like steamed florets, for example, and own a juicer, then a natural solution is to throw those broccoli stalks in the juicer. You won’t get a ton of juice, but you’ll get a decent amount and assuming you’re using a cold-press method, it’ll be chock full of nutrients with comparatively little sugar content. Plus, for most people, it’s a good thing that you don’t get a ton of broccoli juice. Juice recipes that are dominated by broccoli tend to taste very grassy, which isn’t for everybody. Still, it’s not the strongest taste, either, which means that even if you’re not a huge broccoli fan, you won’t even notice when adding other mixed fruits and vegetables to the recipe. It’s not just the Vitamin A and Vitamin C. Broccoli is also chock full of calcium, iron, and other nutrients. Plus, the stalks are every bit as nutritious as the florets. The dark green color of the florets is only indicative of a higher Vitamin A content. If anything, the stalks have more of the other nutrients. If you are serious about broccoli as a superfood, you might also think about eating the high-fiber pulp as well. Rather than juicing, you can blend broccoli in your next smoothie recipe. The florets may be best as part of providing texture to your smoothie without making it too thick, but in smaller quantities, there’s no wrong answer. Again, the key is to think twice about throwing away scraps of broccoli. 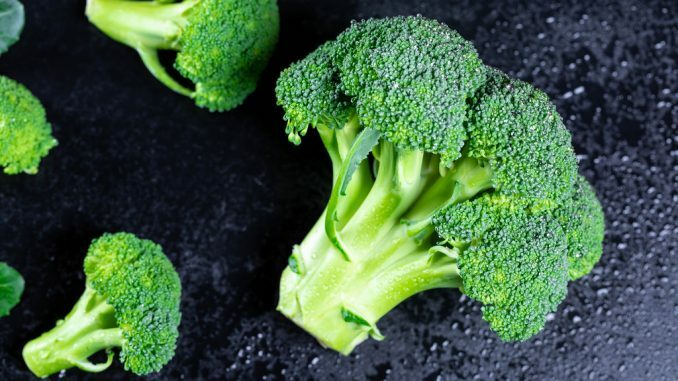 It’s also a great hack for people who don’t like the taste of steamed, baked, grilled, or sautéed broccoli, to still get the nutrients of this superfood into their diet. Stalk or floret, if you’re looking for a complimentary way to consume the entire vegetable, My Recipes has a great list of cooking recipes for this superfood.